The procrastination over this whole issue has been long over-due. They say it's never too late, so i am hoping it isn't. It all started out with two tweets i tweeted on the way to work one morning due to a bad traffic jam that caused the entire expressway to be blocked off. I normally leave my house on time and can reach work on time, but for that day, i was actually late for two hours. Mind you, two hours, not twenty minutes - who wouldn't be pissed? I've yet to remove and delete those tweets, in case you were wondering. To begin with, the tweets do not contain any racist or political remarks. In fact, people pass off such tweets as "angry tweets", which do not actually make any sense or relevance to anyone, unless you too were stuck in the same jam as me. But Omy.sg decided it was an "opportunity" for them. Why opportunity? Read on. Within hours, the story was highly publicized on the front page of their website, and titled in chinese, which i will kindly translate for you - KJE accident causes a bad traffic jam, cold blooded male curses "hope someone die". I am not at all affected by the article they posted because i clearly tweeted those stuff, but after reading the whole article, i couldn't help but realize a few details. "Blogger Jerome Lim posted the information on Facebook and a lot of netizens criticized this cold blooded male"
These were the exact comments posted on the post Jerome Lim posted on Facebook. Point to note also, Omy.sg linked Jerome Lim's post on their website. 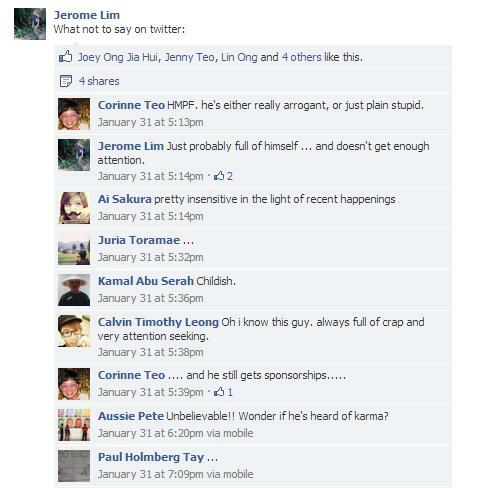 Some of you may ask, who is Jerome Lim? I have no clue either. With more than 3000 followers on my Twitter, he might just be one of them. 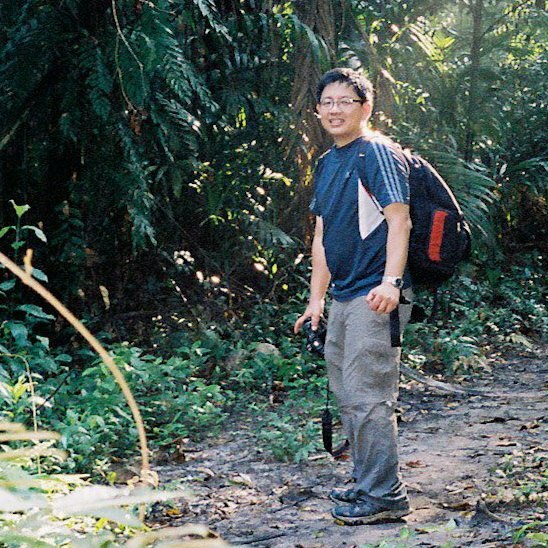 This is Jerome "Kaypoh" Lim, or if you want to put it in a nicer term - Jerome "Ah Pek" Lim. My advice for Jerome is to spend the time going to the gym getting rid of his gut before poking his nose into social media which do not concern or affect him. I decided to search for his blog and since Google is everyone's best friend, it didn't take much effort. "The Long and Winding Road", just like how i described him to be - only an uncle his age would come out with such a lousy tag line for his blog. 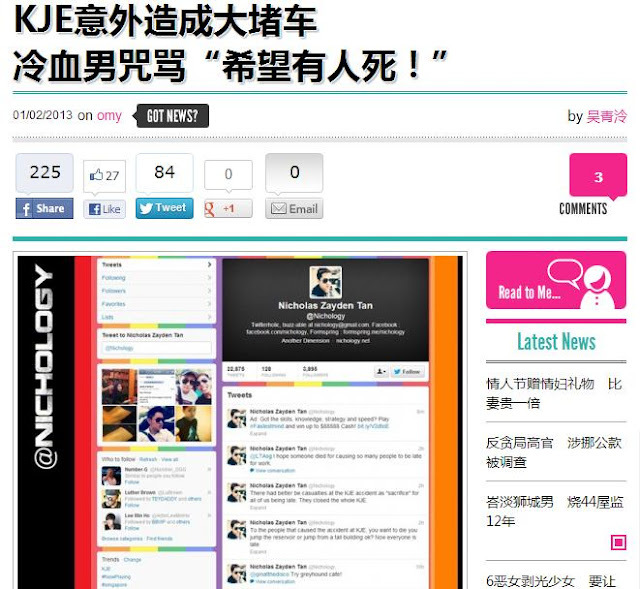 And guess what else i found - Blog Awards from Omy.sg on his side bar. Bingo, he happens to be an Omy.sg blogger (which is also why i don't know of his existence because they have all the half past six bloggers). 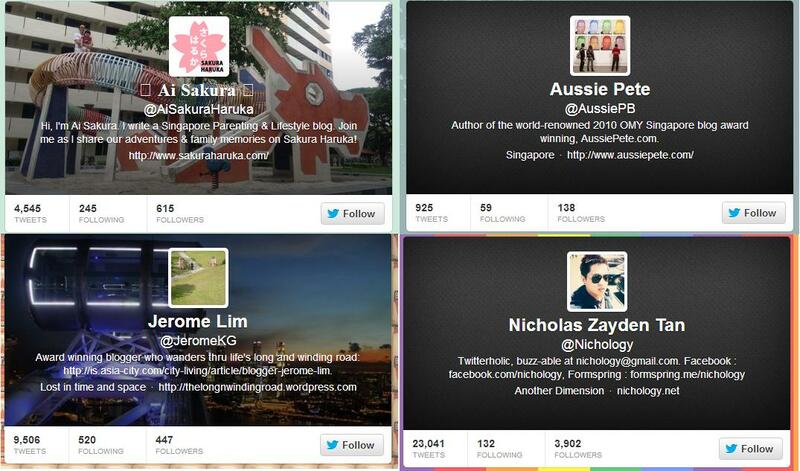 I don't want to name drop but if Omy.sg was THAT GOOD, why isn't Singapore's Top Bloggers with them? That was not all. I mean, i know some of you guys are already convinced that Omy.sg was trying to use my tweets as an opportunity to publicize their blogger (Jerome Lim), but i thought it would be more convincing if i had more to reveal. "Netizen Aussie Pete said : "Unbelievable!! Wonder if he has heard of Karma?" 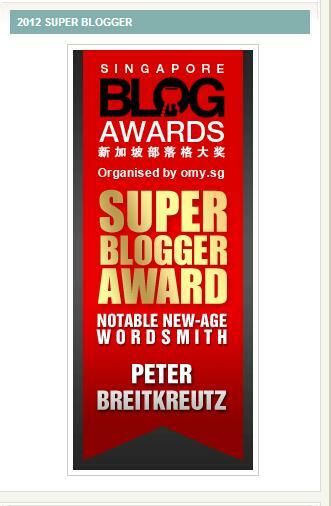 The above is Aussie Pete's blog, and again on the side bar we see a banner with the words "Singapore Blog Awards, organized by Omy.sg". Are you already thinking what i am thinking? I don't even think this "ang moh" understands chinese, or any single word in that Omy.sg article about me. But of course, i am sure he knows he was being quoted, which was probably part of the deal with Omy.sg to publicize him. 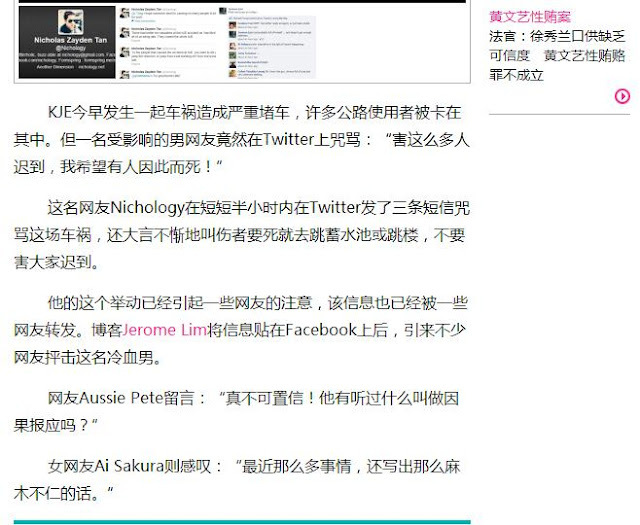 Female netizen Ai Sakura exclaimed : "pretty insensitive in the light of recent happenings". Dear Ai Sakura (if to begin with is your real name), i don't understand your comment towards this whole issue. If your concern was about the recent accident at Tampines which took away the lives of two boys, then i think we are on different wavelengths here. This accident caused a massive jam, which caused the tweets. 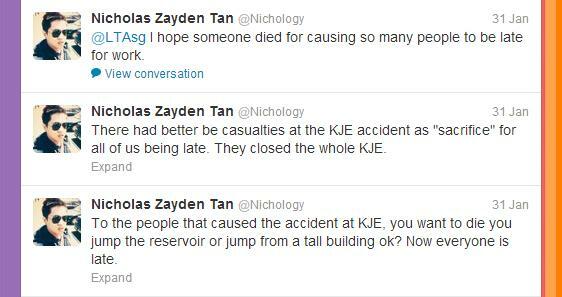 The Tampines accident did not. That is Ai Sakura's blog (also known as Sakura Haruka). I am already confused by how someone can have so many different names online - remembering names of different sashimi at a Japanese restaurant is much easier. 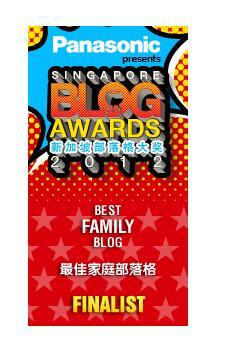 And of course, again, we have *drumrolls* the Omy.sg Singapore Blog Awards on her side bar. Dear Omy.sg, out of all the people who commented on the Facebook post, why these three? And if so, why do they ALL happen to be Omy.sg bloggers, if i may ask? Coincidence, or an opportunity for you to jump at to market your "bloggers"? They also gave me a quarter page mainstream publicity on the second page of Wanbao on the same day, but failed to mention my name on the article. And if you ask me why Wanbao, it's because both Omy.sg and Wanbao are owned by the same company - Singapore Press Holdings. I reckon it was slow news day for Wanbao so they needed "help" to fill up the pages. But looking at the statistics that are public, i clearly understand why Omy.sg is trying so hard. I mean, social media is after all about numbers, right? But they should have played their cards a little better because this plot was clearly too obvious that even an idiot could have spotted it. Don't use news as an opportunity, it makes you look desperate.